The term “sleep potential” is not prevalent in the current literature on sleep research. However, there have been other expressions that attempt to assign values to vary degrees of sleepiness. Like many terms used in sleep research, “Sleepiness” does not have a definition that captures the entirety of its causes or implications that might lead to the adoption of a general type of measurement . The Epworth Sleepiness Scale (ESS) is a more rigorous adaptation of its antecedent, the Stanford Sleepiness Scale (SSS) which proposes absolute classes to assume immediate perception of sleepiness . ESS goes beyond SSS with its situational approach; the subject is asked about their potential to sleep while engaging in mundane activities throughout the day . The ESS like SSS relies solely on the subjective answers to questionnaires and no physiological data contributes to the determination of general wakefulness. The accuracy of the data is more worrisome in ESS than its antecedent because it reports on an “expectation”, not the actual experience. In fact, the ESS questionnaire encourages the subjects to estimate an answer even if they have not participated in the event recently . Recalling specific details from memory is subject to distortions that only get worse as time passes . Therefore, data gathered from recollection cannot be purged from bias . Consequently, a generally adaptable “sleepiness” measurement framework cannot be developed from questionnaires, it must be derived from quantifiable physiological data. It is worthy to note that the pessimistic assessment of the preceding methods is not unique, Carskadon et al. described the use of the Stanford Sleepiness Scale (SSS) as partly successful and further stated that similar methods contained idiosyncrasies that cannot be generalized for mainstream clinical adoption . The data gathered using the Epworth Sleepiness Scale (ESS) may not be regarded as an objective measurement of sleepiness especially among subjects who suffer from Obstructive Sleep Apnea (OSA) . Conversely, the more clinically reliable Multiple Sleep Latency Test (MSLT) is characterized as cumbersome because it is disruptive and takes a long time to perform. The Maintenance of Wakefulness Test (MWT) provides an alternative solution to determining the severity of a specific kind of sleep disorder – narcolepsy. The test design is biased to measure wakefulness given that the subjects have no difficulty in falling asleep . The actual age of the patients is unknown as well as their distribution into relative age groups. However, it was stated that all participants were at least 40 years old [9-12]. QRS detection is usually an essential component of research activities requiring the analysis of ECG waveforms. As a result, several algorithms have been developed to detect the location of the QRS complex with the ECG waveform. In most cases, the detection requires the application of a high-pass filter to attenuate the P and T waves, this is particularly useful because the R wave is the peak of the ECG waveform and as a result, the easiest to identify . 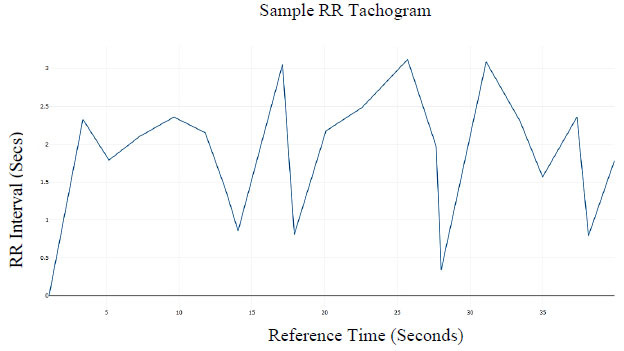 The accuracy of the resulting RR tachogram is a function of the ECG digitization sampling frequency . Fig. (1) below 40 second ECG signal derived from poly-somnography records provided by the National Sleep Research Resource (NSSR) , to illustrate QRS detection in this study. Fig. (2) shows the ECG signal overlaid with the analytic signal (the Hilbert transform of the ECG signal). Fig. (3) shows the differentiated referenced ECG signal, which increases the noise but also tend to accentuate the peaks and Fig. (4) shows the differentiated referenced ECG signal overlaid with the analytic signal. In this case, the Hilbert transform of the differentiated ECG signal does not seem to offer a clear advantage for peak detection. However, since the Hilbert transform of a signal simplifies peak detection, the analytic signal of the differentiated ECG signal is used in this study. Subsequently, the R peaks can be located and an RR time-series tachogram of RR-intervals can be developed. A plot of the RR time series is shown in Fig. 5. Fig. (1). 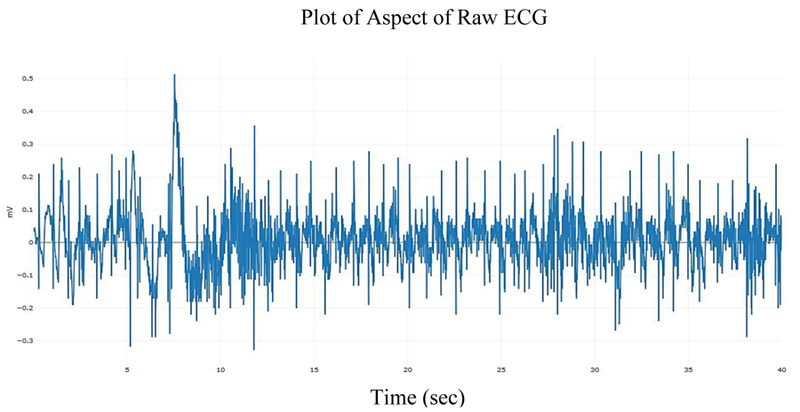 Plot of Raw ECG signal showing time varying (seconds) heart electrical activity. Fig. (2). Plot of Raw ECG signal showing time-varying (seconds) heart electrical activity with Hilbert Transform. Fig. (3). Plot of Differentiated ECG signal showing time-varying (milliseconds) heart electrical activity. Fig. (4). Plot of Differentiated ECG signal showing time-varying (milliseconds) heart electrical activity with Hilbert Transform. Fig. (5). Plot of Resulting RR Interval Time Series (Tachogram). Fig. (6). Neural Network Diagram. Table 1. Convergence time(s) in determining Network Architecture. The figure below shows Fig. (7) the comparison of the TTS prediction (a measure of sleep onset latency) with the actual values obtained from clinical annotations of the test set. As expected, in most cases, the sleep onset latency predictions were very close to the observed values. The deviations observed are assumed to belong to patients who have endured a severe cardiovascular event, or may have assistive devices like a pacemaker or actively have congestive heart failure causing deviations in the recorded electrocardiograms which might have affected the quality of QRS detection, which in turn might imply an erroneous RR (NN) beat to beat sequence which if true, may lead to bad out of sample performance of those specific test data. 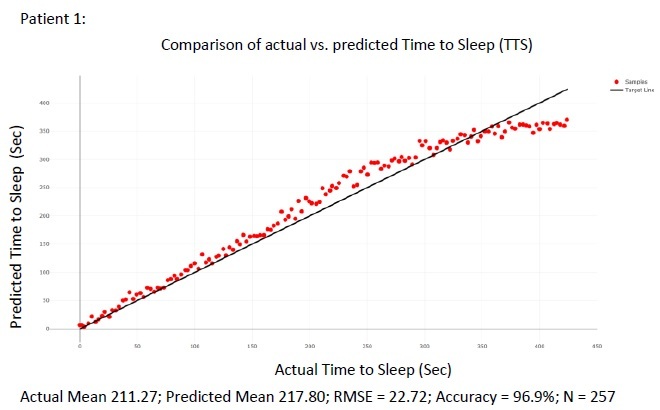 The figure above summarizes the error in the mean predicted Time To Sleep (TTS) and measures Time To Sleep (TTS) for all 105 patients in the test set Figs. (8 and 9) show. detailed results are presented for 2 of the patients in the test sets for the purpose of illustration. 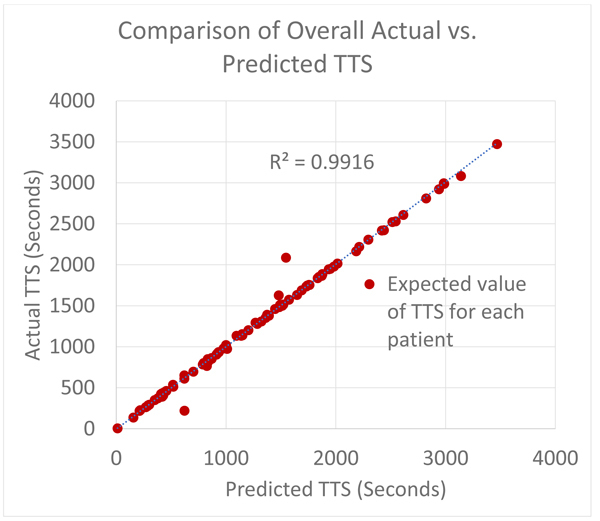 For each of the patient shown in the raw results, N points were selected from the wake cycle and TTS was predicted for each point. The mean value is reported as well as the Root Mean Squared Error (RMSE). Fig. (7). 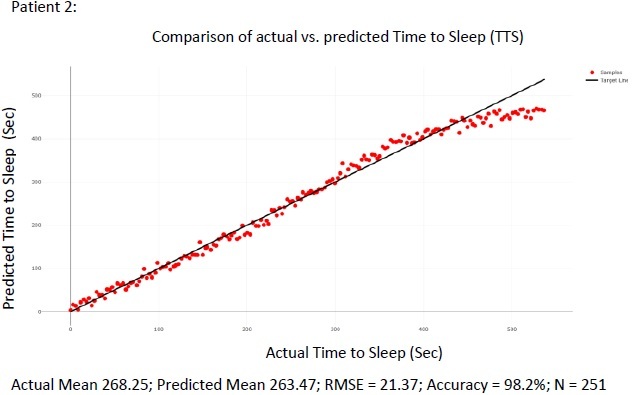 Comparison of the actual mean Time to Sleep (TTS) to the mean predicted Time to Sleep (TTS) for the 105 patients in the test set. Fig. (8). Comparison of the actual TTS to the predicted TTS using different points wake cycle Actual Mean 211.27; Predicted Mean 217.80; RMSE = 22.72; Accuracy = 96.9%; N = 257. Fig. (9). Comparison of the actual TTS to the predicted TTS using different points wake cycle Actual Mean 268.25; Predicted Mean 263.47; RMSE = 21.37; Accuracy = 98.2%; N = 251. Johns M W. A new method for measuring daytime sleepiness: the Epworth sleepiness scale. Sleep 1991; 14(6): 540-5. Schacter DL. Searching for memory: The brain, the mind, and the past. Basic Books 2008; 1-5. Carskadon M A, Dement W C. The multiple sleep latency test: what does it measure? Sleep: Journal of Sleep Research & Sleep Medicine 1982. Mitler MM, Gujavarty KS, Browman CP. Maintenance of wakefulness test: a polysomnographic technique for evaluation treatment efficacy in patients with excessive somnolence. Electroencephalogr Clin Neurophysiol 1982; 53(6): 658-61. Chervin RD, Aldrich MS. The Epworth Sleepiness Scale may not reflect objective measures of sleepiness or sleep apnea. Neurology 1999; 52(1): 125-31. Shen J, Barbera J, Shapiro CM. Distinguishing sleepiness and fatigue: focus on definition and measurement. Sleep Med Rev 2006; 10(1): 63-76. Hon EH, Lee ST. ELECTRONIC EVALUATION OF THE FETAL HEART RATE. VIII. PATTERNS PRECEDING FETAL DEATH, FURTHER OBSERVATIONS. Am J Obstet Gynecol 1963; 87: 814-26. Dean DA II, Goldberger AL, Mueller R, et al. Scaling up scientific discovery in sleep medicine: the National Sleep Research Resource. Sleep (Basel) 2016; 39(5): 1151-64. Riedmiller M, Braun H. A direct adaptive method for faster backpropagation learning: The RPROP algorithm. Neural Networks, 1993, IEEE International Conference on 1993; 586-91. Baldi P, Sadowski P. The dropout learning algorithm. Artif Intell 2014; 210: 78-122. Quan SF, Howard BV, Iber C, et al. The Sleep Heart Health Study: design, rationale, and methods. Sleep 1997; 20(12): 1077-85. Redline S, Sanders MH, Lind BK, et al. Methods for obtaining and analyzing unattended polysomnography data for a multicenter study. Sleep 1998; 21(7): 759-67. Dietterich TG. Approximate statistical tests for comparing supervised classification learning algorithms. Neural Comput 1998; 10(7): 1895-923. Toscani L, Gangemi PF, Parigi A, et al. Human heart rate variability and sleep stages. The Italian Journal of Neurological Sciences 1996; 17(6): 437-9. Busek P, Vankova J, Opavský J, Salinger J, Nevsimalova S. Spectral analysis of heart rate variability in sleep. Physiological research 2005; 54(4): 369..
 Ogundare O. An analysis of electrocardiograms in developing statistical learning models for instantaneous sleep quality and sleep potential prediction 2018.